Below is the link to the Cartridge Save website page displaying all cartridges that will work with your Ricoh MPC 3000. At the bottom of the page is a list of all printers that these cartridges will work in. Can I please get an approximate toner quantity for the Ricoh MPC3000 black cartridge? The genuine Ricoh 888640 black toner cartridge for the Ricoh Aficio MP C3000 printer has a capacity of approximately 20,000 pages based on 5% coverage of the page. The Ricoh Aficio MPC3000 is a multifunctional colour laser system capable of making copies, printing, scanning, and also faxing. The MPC3000 is capable of producing both monochrome and full-colour prints at around 30 pages per minute with a warm-up time of less than 45 seconds. The central processing unit consists of a RM7035C at 600 Mhz embedded processor with 1GB of standard memory and a 40GB shared disk drive. Document resolution settings can be configured to around 600 by 600 dpi in prints and scans while the G3 facsimile transmittal works at an extimated 33.6Kpbs. The Ricoh MPC3000 is fully compatible with most Windows, Novell, Unix, Linux, and IBM AIX operating systems and features a bevy of portability options with Wireless LAN interface, Blutooth, Parallel, and USB outputs. Considering the scope of work the all-in-one MPC3000 is capable of, its 65 cm wide by 66 cm deep by 74 cm high frame leaves only a modest footprint. 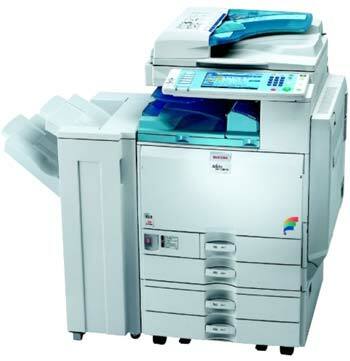 This system is perfect for any medium to large sized office with high-volume printing needs. The Ricoh MPC3000 toner system is readily available via a panel which can be opened up from the front. An easy to use, over sized, full-colour LCD touch panel adorns the front of the unit for easy document setup and configuration. The Ricoh MPC3000 cartridge system is very easy to access and replace. The unit comes equipped with a variety of finishing capabilities including hole-punching, saddle-stitching, and folded booklets as well as document management options like archiving and scan to/from. The paper supply on the MPC3000 is quite large at a 3,200 sheet capacity and a standard duplexing feature along with an automatic reversing document feeder help to minimise per page costs. As long as you don't plan on moving it around the office very much, the MPC3000 should be a fine office work horse.